This free demographic data produced by the US Census Bureau from 2010 survey data has been engineered for easy use with our MapInfo Professional®. Contains state-level information for Iowa, Illinois, Indiana, Kansas, Kentucky, Michigan, Minnesota, Missouri, North Dakota, Nebraska, Ohio, South Dakota, Wisconsin and West Virginia. 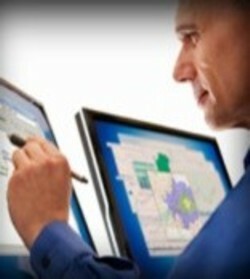 Pitney Bowes Software has specially formatted the 2010 US Census data provided freely by the US Census Bureau for use with MapInfo Professional®. This data set contains state-level information for IA, IL, IN, KS, KY, MI, MN, MO, ND, NE, OH, SD, WI and WV gathered under Public Law 94-171 (PL94-171) and contains summary statistics on population and housing subjects derived from questions on the 2010 US Census questionnaire. This product combines the 2010 Census TIGER/Line boundaries in MapInfo TAB format with the PL94-171 data. Population counts, aggregated to several geographic levels, are presented for the total population and for the population 18 years and over (the voting-age population). This data is used in political redistricting, which is the process of drawing legislative boundaries of equal population counts consistent with the 2010 Census results. Tabulations of the population by race and Hispanic origin are also included. The most up-to-date demographic data for business decision support! Great for sales planning, expansion and contraction decisions and target marketing. While redistricting is the primary use for this first wave of 2010 Census data, many data users will find this information useful for other purposes. In particular, by comparing Census 2010 results to Census 2000 results users can measure population change over the ten-year period. Some areas will show growth while others with show decline. State level demographic detail is provided for Iowa, Illinois, Indiana, Kansas, Kentucky, Michigan, Minnesota, Missouri, North Dakota, Nebraska, Ohio, South Dakota, West Virginia, and Wisconsin in this package. This product contains summary statistics on population and housing subjects derived from questions on the 2010 Census questionnaire. Data gathered includes: a count of all persons by race, a count of the population 18 years and over by race, a count of Hispanic or Latino and a count of not Hispanic or Latino by race for all persons, and a count of Hispanic or Latino and a count of not Hispanic or Latino by race for the population 18 years and over. While redistricting is the primary use for this first wave of 2010 Census data, many data users will find this information useful for other purposes. In particular, by comparing Census 2010 results to Census 2000 results users can measure population change over the ten-year period. Some areas will show growth while others with show decline. Pitney Bowes Software has provided this data on the Census Bureau’s TIGER/Line 2010-based rosters. While many of the smallest geographic units (census blocks, block groups, and tracts) have changed from the 2000-based version, higher level geographic comparisons between 2000 and 2010 are generally valid. Similarly, the demographic change in the composition of the population by race and Hispanic or Latino origin can be measured. Tabulations are provided for the total population and for persons not of Hispanic or Latino origin by race. The PL94-171 data product also contains counts of total housing units, occupied housing units, and vacant housing units. Occupied housing units are considered “households” and are useful for many purposes. This free demographic data produced by the US Census Bureau from 2010 survey data has been engineered for easy use with our MapInfo Professional®. Contains all 50 states, Washington DC and Puerto Rico. This free demographic data produced by the US Census Bureau from 2010 survey data has been engineered for easy use with MapInfo Professional®. Contains state-level information for Connecticut, Washington DC, Delaware, Massachusetts, Maryland, Maine, New Hampshire, New Jersey, New York, Pennsylvania, Rhode Island, Virginia and Vermont. This free demographic data produced by the US Census Bureau from 2010 survey data has been engineered for easy use with MapInfo Professional®. Contains state-level information for Alabama, Arkansas, Florida, Georgia, Louisiana, Mississippi, North Carolina, Oklahoma, South Carolina, Texas and Tennessee and the Commonwealth of Puerto Rico. This free demographic data produced by the US Census Bureau from 2010 survey data has been engineered for easy use with MapInfo Professional®. Contains state-level information for Alaska, Arizona, California, Colorado, Hawaii, Idaho, Montana, New Mexico, Nevada, Oregon, Utah, Washington and Wyoming.